THOUSANDS of people are expected to visit Hinckley town centre later this month to see the town’s spectacular Christmas lights get switched on. This year’s event on Friday 16 November will get underway at 4pm. The lights will be switched on at 6:30pm by Hinckley’s BBC Sports Personality Unsung Hero Denise Shannon along with successful local male vocal group 4th Avenue and mayor of the borough, Councillor Jan Kirby. The festivities will get underway from 4pm with a full programme of entertainment taking place on stage in the Market Place. Stage production and sound will be provided by Castle Mead Radio and Fosse 107 and the programme will include performances from 4th Avenue, Vicky Anne Academy of Dance, Fern and Lisa, Steve Faulkner, The Drama Academy and Hastings school. Hinckley‘s Concordia Theatre pantomime cast will also take centre stage to give us a preview of what this year’s pantomime has in store. Meanwhile, children will get a chance to see live reindeer and meet Santa in his grotto, which will be located at the top of Castle Street. A free Christmas crafts workshop for children will also be taking place at the United Reformed Church as part of the event. Families are invited to drop in between 5:30pm and 7:30pm to make a range of Christmas crafts to take home. The lights switch-on will also coincide with the staging of the traditional Tin Hat Fair in Regent Street. The fair will be open from 4pm until 10:30pm on Friday and from 11am to 9pm on Saturday. All relevant road closure information will be detailed on our website. The Christmas lights switch-on in Hinckley is one of the first across the borough and it’s always one of the most popular events of the year. With live entertainment, the usual fireworks, the Tin Hat Fair, and plenty of places to eat and shop it’s always an unforgettable evening, and I hope everybody has a happy and safe time at this year’s event. For those wanting to bring elderly and less mobile residents to view the lights I would recommend our drive through on Wednesday 5 December. Seeing the lights without all of the crowds is great, but the night is not complete without a warm drink, mince pie and music at the United Reformed Church. This is a great event and I hope as many people as possible will come along to enjoy it. Argents Mead will be closed and no access allowed from 6:20pm to 6:45pm to accommodate the fireworks. Hinckley Leisure Centre will be open as usual, with access available from St Mary’s Road/Leisure Centre car park side only between 6:20pm to 6:45pm. The council urges people to stay where they are to view and not to head to Church Walk. 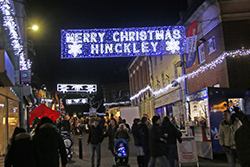 Hinckley’s annual Christmas lights tour for the elderly and disabled people will be held on Wednesday 5 December. Castle Street will be open to traffic from 6pm to 7pm to allow the general public to drive down with their elderly or disabled family and friends, allowing them to view the lights. There will be festive music and mince pies in the United Reformed Church and cars will be able to park on Regent Street. For more information contact Sherrilee Burdett, Events and Town Centre Co-ordinator, on 01455 255893.